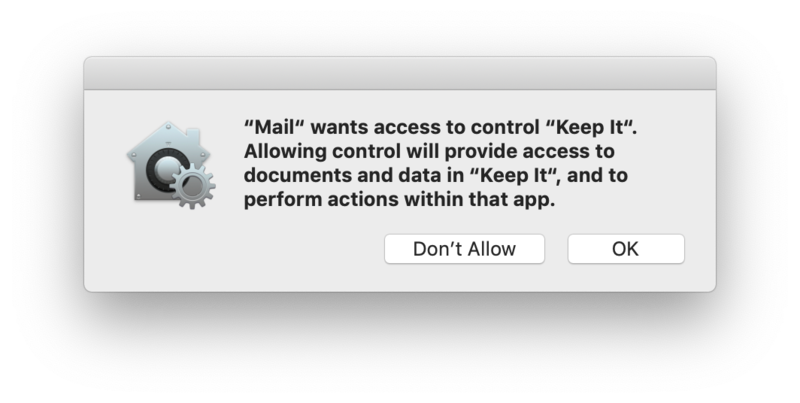 Keep It has no online server where you can send it messages, but you can use Mail's rules to achieve the same thing on your Mac. If you want a way to add emails as-is to Keep It, download the Automator workflow instead. One script creates a new note with the content of the message, and another adds all the attachments to Keep It. Under "Perform the following actions:" choose "Run AppleScript"
From the adjacent pop-up, choose "Open in Finder"
For the attachments script, you may also see a similar message for "System Events".